Obviously, the music industry is a cynical & cyclical business but SoCal band Korn have weathered those storms for 20+ years. 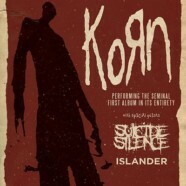 In celebration of their longevity Jonathan Davis and co. have decided to perform their self titled release “Korn” track by track in it’s entirety. Support for this extravaganza are deathcore stalwarts Suicide Silence & rapidly rising road dogs, Islander.